Home / TallyERP.9 Lessons / How to Print All Ledgers / Books for a year in TallyERP.9? 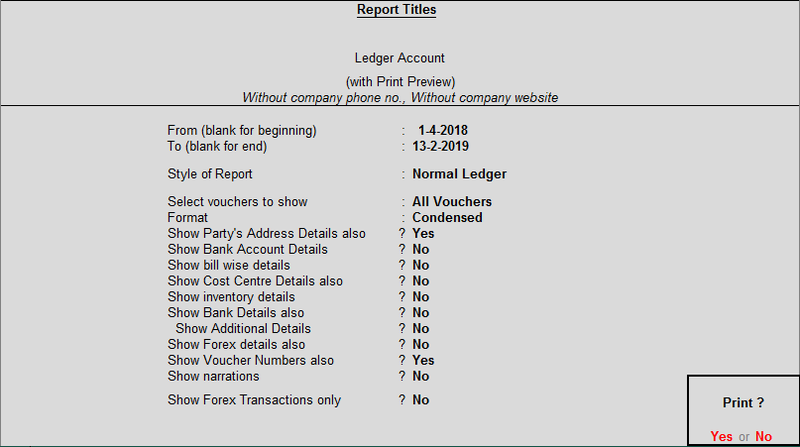 How to Print All Ledgers / Books for a year in TallyERP.9? In this lesson we learn for how to print all Ledgers/ Books in Tally for a financial year. All books printing is very helpful to maintain records for a particulars financial year. Printing of all books having different options starting with year details and voucher details/ condensed, with or without narration, bill wise details, inventory wise details, details of cost center, banking allocation details, Forex details (only applicable for use of multi currency). Select option All Accounts, printing configuration appear on your screen. Press Enter and Select yes. Your all books print command will be start to print. You can also convert your all books to pdf version. For convert into pdf you need to install any pdf printer in your computer. While give print command press Alt + S for select PDF Printer and press enter. System ask you to save the All Books in pdf version. Select your desired location and save. You also able to this pdf at any time when you require.